Store garlic at a consistent temperature of between 45 degrees Fahrenheit to 50 degrees Fahrenheit for three weeks prior to spring planting. Keep the cloves in a dry and dark place. Planting should take place in February or March. Mix a ratio of 50 percent peat moss with 50 percent garden soil. Garlic prefers to be planted in well-drained soil with adequate nutrients. Mix 2 pounds of 10-10-10 fertilizer per 100 square feet into the garden soil and peat moss one week prior to planting. Gently break the large bulb of garlic apart into cloves. Only use large cloves to plant. The larger the clove, the greater the size of the garlic yield. Separation should be done 24 hours prior to planting. Planting cloves within 24 hours of division helps ensure that the root bases are not allowed to dry out or the clove will loose its ability to grow a rapid root system successfully. Space each garlic clove 8 inches apart to allow the plants ample room to grow and produce. 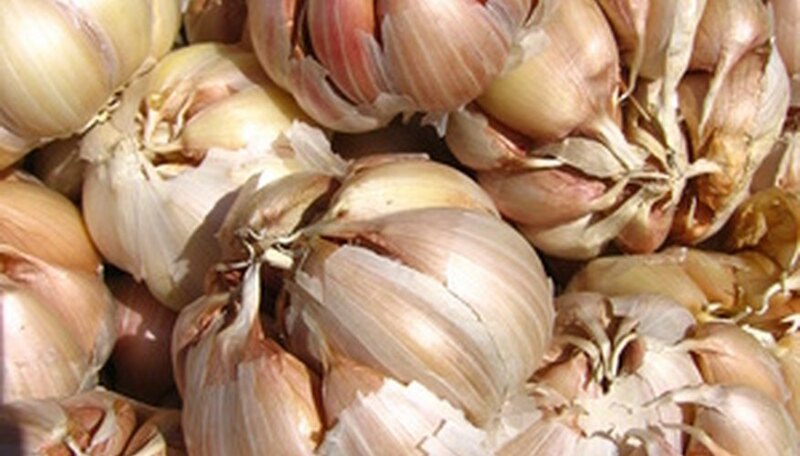 Crowding garlic will often result in smaller garlic bulbs. Plant the garlic with the clove tip 2 inches below the soil and pointing straight up. Add 2 to 3 inches of mulch over the newly planted garlic. Peat moss, bark chips, sawdust or leaf mulch are ideal. The mulch will help keep weeds at bay and help the soil retain its moisture content. Water the garlic to keep the soil moist but not water-logged. Three weeks after planting, fertilize the garlic using a 10-10-10 fertilizer at a ratio of one pound per 100 square feet. Cease watering the last few weeks before harvest. Harvest the garlic when the leaves begin to die back and turn yellow. Gently pull the bulbs from the ground using your hands with a pair of gloves on. Harvest can usually be achieved six to eight weeks after planting depending on the variety grown. Planting garlic in the spring will normally result in smaller bulbs. Nematodes, white rot and thrips all plague garden plants. 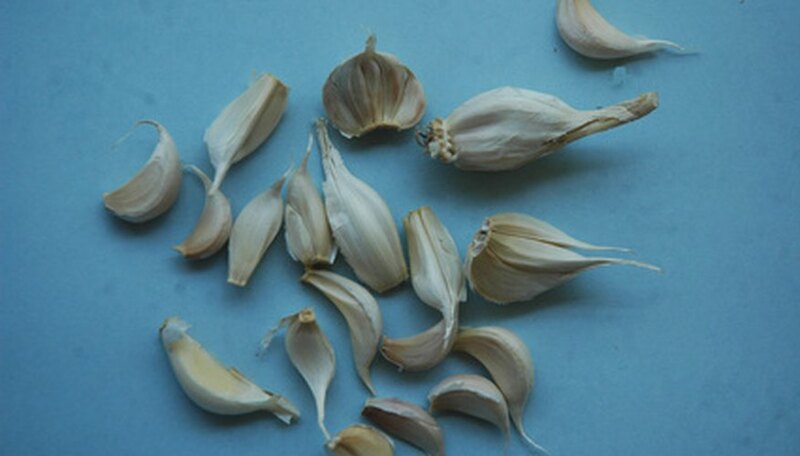 Garlic cloves should not be laid out in direct sunlight or their flavor will alter.